This is another title that Winworld does not quite have yet, but I have added two shareware versions that have survived in hopes of eventually finding the full version. 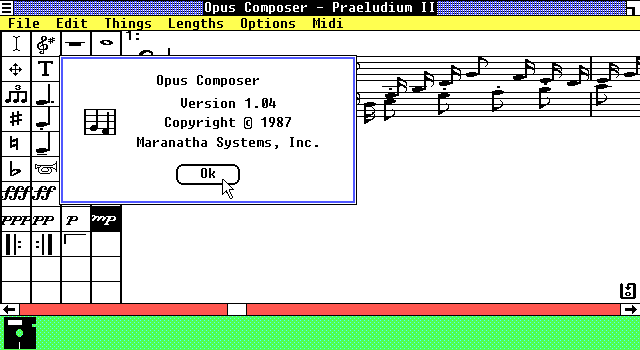 WinSong Composer, first released as Opus Composer in 1987 by Maranatha Systems, Inc, is a music notation program that supports Microsoft Windows 1.x and 2.x. It can also play back music through a music driver program, that apparently in the full version supports MIDI interface devices. Sadly, the shareware versions only include a "demo" of this driver program which plays back music on the PC Speaker. 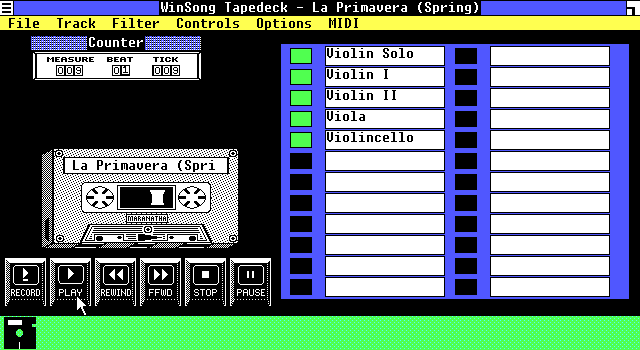 It would be interesting to hear MIDI coming from Windows 1 in DOSBox. There really isn't much information about this program out there. It was sold commercially, but seemed to be targeted at a rather limited audience. It was distributed by MidWest MIDI Consultants. It also includes a "Tape Deck" program that acts as a media player and lets you adjust channels or other MIDI properties. It includes several sample music files. One other shred of information indicates it was distributed and supported on the Maranatha Software Exchange BBS run by Dave Norris. 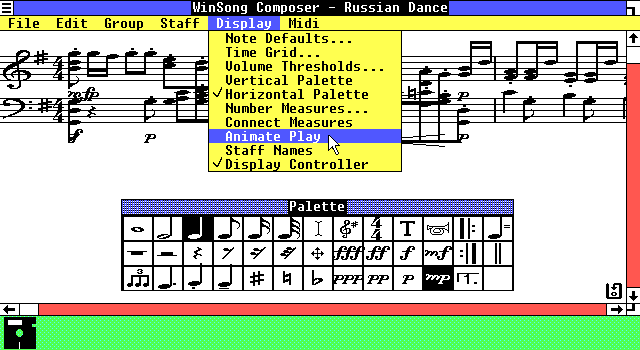 "WinSong features a professional quality music composition system with intelligent beaming, dynamics, automatic translation to and from MIDI, and laser printing with fonts. In addition, you get an easy to use 24-track sequencing program with such advanced features as electable quantization, auto-punch with markers, de-flam, and much more. WinSongTM also includes a system-exclusive filing program for your patches and a Jukebox application, perfect for setting up "live" shows. WinSong works with all of the major MIDI interfaces, including the Roland MPU-401 and compatibles. IBM Music Feature, and Cheetah-MIDI. And, with Microsoft Windows, you can run all of your tools at once. You'll get better sounds too - because at $249.95 (suggested retail) you can afford that better synthesizer you've been ogling. WinSong requires an IBM PC or compatible Microsoft Windows and a mouse. 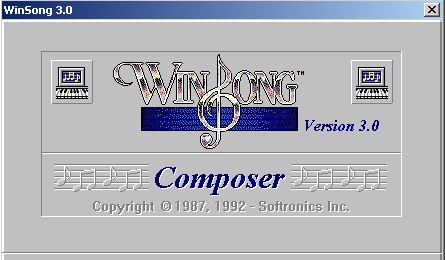 WinSong is available through MidWest MIDI Consultants (405) 736-6676"
It seems there was another, later program called WinSong for Windows 3.1, but it is not clear if it is related. There is not much more information. This program was rather specialized, and would have had only a small user base. It sure would be neat to hear MIDI music coming from Windows 1.x and 2.x. I don't know if you are interested or not but I was looking through my older Windows Software and I came across WinSong. It is Softronics WinSong 3.02.05. I think I bought it in the early '90's. It came on 2 3 1/2 in floppies, one is the Install Disk and the other is labeled Disk 1. I imaged both of the floppies and installed them in a WinXP VM. The program worked great. Yes, please do send that our way. Thanks. This is what you get after it is installed. How do I send the 3 diskette images your way?